Often when you buy a new PC or laptop, you don’t get the operating system on CD in order to reinstall it if you hit any problems. Instead, they have a hidden partition on the hard drive which contains all the system software – if you need to restore the PC, you hit one of the function keys while the computer is booting and it takes you into a recovery program. If you wipe your hard drive, though, you can lose that partition and you’re left without an operating system. If you bother reading the manual it’ll probably have instructions for creating recovery media – you really should do this as your first action, it’ll save lots of messing about later. Suppose the worst has come to the worst, you’ve deleted the partition and haven’t burned any recovery disks. On a PC which comes with Vista installed, you’ll find a blue, green and pink sticker on it somewhere with a 25 digit product key (XXXXX-XXXXX-XXXXX-XXXXX-XXXXX). If the sticker mentions the brand of your PC (Dell, Advent, HP etc) then you have an OEM version of the software. If it doesn’t you probably have the full retail version and likely have a boxed Vista installation disk somewhere. In my case, I had an Advent OEM product key. I had a full retail version of Vista (Home Premium Upgrade version) which I had bought to upgrade an XP machine a while ago. 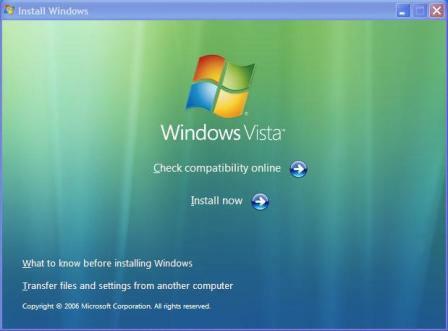 The good thing is that the Vista installation disk actually contains all versions of the OS – the product key supplied with the disk is what determines which version of the software you can install. I tried installing Vista using the OEM product key from the bottom of my laptop, but it was rejected as not being a valid key! After much trial and error, I found a solution. A non-profit organization called Neosmart have produced a Vista recovery disk which is intended to allow you to restore from backups if you don’t have an installation disk. It appears to be the installer from the official Vista disk repackaged. It doesn’t contain any of the files which would be required to install a complete working Vista system though. Download the iso file from the link above (you may need to Google to find a working download link) – it’s about 120MB in size, and burn it to a CD using your favourite CD creation software – I used the excellent and free InfraRecorder and boot your failed PC from this disk. The product key should be happily accepted and the Operating System will install as normal. Once the OS has installed, follow the wizard and set up your Admin user etc. Once you are at the desktop go to the start menu, right-click on ‘computer’ and choose properties. 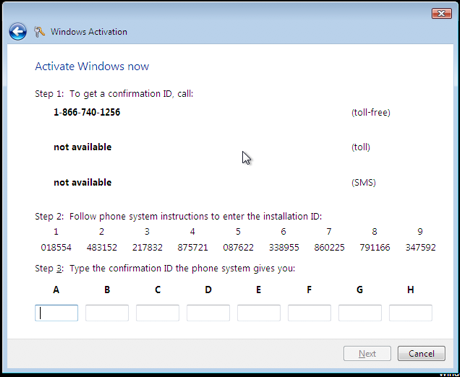 Scroll down to the Windows activation section and you should see something like ‘3 days until automatic activation. Activate now‘. If you have an internet connection try activating by clicking the link – in my case this did not work. If this happens to you, choose the ‘automated telephone line‘ activation method. This will involve calling a toll-free number and entering the 54(!) numbers from the activation wizard using your phone, then typing the 48(!) numbers read out to you on the phone – this will result in an activated, legal copy of Vista. Please leave me a comment if you found this useful!